How to write JAMB CBT Exam: Many candidates find it difficult to answer JAMB Computer Based Test (CBT), it is not because they are not intelligent but reasons may vary, most candidates find it difficult to use CBT, most are not conversant with it, But we are here to give you all, a complete guide on How to Write The Joint Admission And Matriculation Board, JAMB CBT Examination. We have carefully arranged this guide to give all candidates the best JAMB CBT tutorial, that will enable them to answer questions without stress, this article is put together to help candidates understand how the system works, once you are able to read and understand this write up, you will smile at the end of the exams. With this guide, you need not to be scared of JAMB CBT examinations again, because in here we have pictures to illustrate for a clearer understanding. 4 Radio Buttons – How Do I Use Radio Buttons? 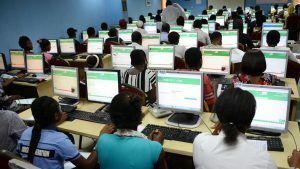 Here you will find the guide which includes procedures with pictures, of using the computer in answering questions during the JAMB CBT Exam. Once you have Clicked on the above pictures, you will notice that the image highlights several buttons which circles round important texts, we will explain what they stand for and you will get full knowledge of it. i. Subject area: where the JAMB CBT subject taken is located. iii. Remaining time you have for the examination. iv. We urged all candidates sitting for the exam, to check the time lapse and time remaining to be able to complete the exams on time, be aware of the remaining time, will surely help you answer questions faster and know that your time is limited… This will super-charge you to do what you are expected to do – Write! v. Instruction area: This place, candidates can go and check the instructions concerning the exams. a. Please use the mouse carefully, by putting the heel of your hand on the table in front of the mouse. 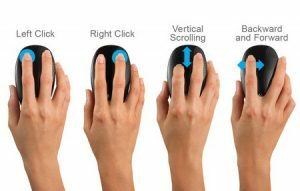 And hold the mouse between your thumb and the ring fingers. b. Make sure you put your index finger on the left mouse button. c. Also, you should move the tip of the arrow onto the underlined two. The arrow will become a pointing finger on the computer screen. 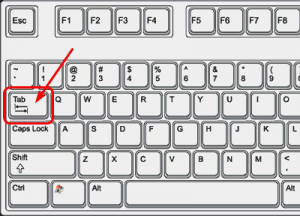 d. You should also note that the arrow automatically becomes a pointing finger, to answer the questions, simply hold the mouse still and lightly click the left mouse button with your index finger or any finger that works best for you. Related: JAMB 2019/2020 Registration Form, Exam & closing date. Radio Buttons – How Do I Use Radio Buttons? Below is how you can use the radio buttons but before we get to that point lets explain what the radio buttons are, the circles below are called radio buttons, which is always used in computer examinations, also implemented in JAMB CBT questions. Using a MOUSE you can click the below radio buttons as examples. The buttons will be used as illustrated in the exams panel above, to select the correct answer. The candidates who are writing the JAMB CBT examination will be required to pick the correct answer(s). 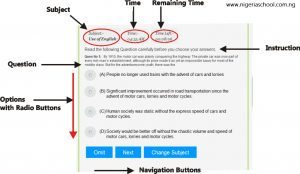 You can see an example of how the multi-choice question works. Take note here, that only one radio button can be “on” at the same time, you can’t select two answers. For you to proceed to the next page/question, click on the Next button which is located under each question. After choosing the best answer to the question, to save time, you should proceed and click the NEXT button to go to see the next question until you are through with every question. Kindly know that you can still omit or skip any question which you are not familiar with, or you don’t know the answer to. You still have the option of coming back to answer the question – if you still have time. With this guideline, you will find the system easy to use, and you will not keep patronizing JAMB every year. Success Is YOURS! If you find this guideline useful, just click on the Facebook share button and share with others.